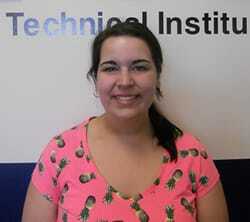 Congratulations to Kelly Baldic, our NTI Bangor Student in the Spotlight! Kelly is currently a fulltime Medical Billing and Coding student, who recently graduated our Medical Office Assistant program and made the choice to continue her education. She has maintained an excellent academic record, while also balancing work and travel. Kelly always has a positive attitude towards her fellow classmates and staff. She will be an excellent employee and great representative of the NTI Bangor Campus. Please join us in congratulating her on this achievement!